A significant event took place in the history of Georgia on 24 August 1995- the Parliament of Georgia adopted the Constitution of Georgia. The Constitution enshrines the will to establish a democratic, and Rule of Law based social state, to enhance the state independence and peaceful relations with other peoples, to secure universally recognised human rights and freedoms. The Constitution of Georgia derives from the centuries-old traditions of the statehood of the Georgian Nation and the basic principles of the Constitution of Georgia of 1921. The Constitution endorses discharge of authority on the basis of separation of powers. The Constitutional Court of Georgia is the judicial body of constitutional review, having the greatest significance with the view of securing constitutional provisions, separation of powers and its accomplishment within the constitutional framework, protecting human rights and freedoms, recognised and guaranteed by the Constitution, enhancing public stability in the country. The Constitution of Georgia recognizes the rights and liberties of an individual as persistent and prevailing values; it sets forth the main directions for legal, economic and social development of the country and creates a legal framework for determining actions of the State organs. Ensuring the principle of separation of powers and an actual enforcement of the supremacy of the Constitution is a significant precondition for proper protection and practical realization of fundamental human rights and the rule of law. Under the Constitution, the State has an obligation not to engage in unjustified restriction of human rights and to ensure proper exercise thereof. The main function of the Constitutional Court of Georgia, as of the body conducting constitutional judicial review, is to protect supremacy of the Constitution, human rights and liberties, as well as to ensure that branches of the government act within the limits prescribed by the Constitution. The Constitutional Court performs its functions mostly by examining constitutionality of normative legal acts. A normative act which was declared unconstitutional loses its legal force upon publication of the relevant judgment. Moreover, judgments of the Constitutional Court are binding on every branch of the government. By interpreting and applying constitutional provisions, the Constitutional Court of Georgia determines the main path for development of the country’s legal system. Judgments of the Constitutional Court are of general application and their consequences might apply to each member of the society. Accordingly, it is of utmost importance to provide each branch of the government and the public with comprehensive information regarding activities of the Constitutional Court and development of its case law. 2018 has been a very productive year for the Constitutional Court. Throughout the past year, 93 constitutional complaints and 2 referrals were registered within the Constitutional Court, and the Court finalized the proceedings with respect to 64 constitutional complaints. It is noteworthy that the Court has rendered important judgments aiming to safeguard the rights and liberties of the accused as well as those of other participants of criminal proceedings. The Court made clarifications with respect to the principles of equality of arms and adversariality in criminal proceedings, as well as the rights of the accused or convicted persons placed in penitentiary facilities, - in particular, regarding their right to inviolability of personal dignity and private life, their right to be protected from degrading treatment, and the right of an individual to appeal decisions with respect to their victim status before the court. In 2018, the Constitutional Court of Georgia has developed new approaches with regard to free competition. The Constitutional Court found that any unjustified interference within competition which privileges either of economic agents constitutes a threat to the process of creation of equal and fair market economy. 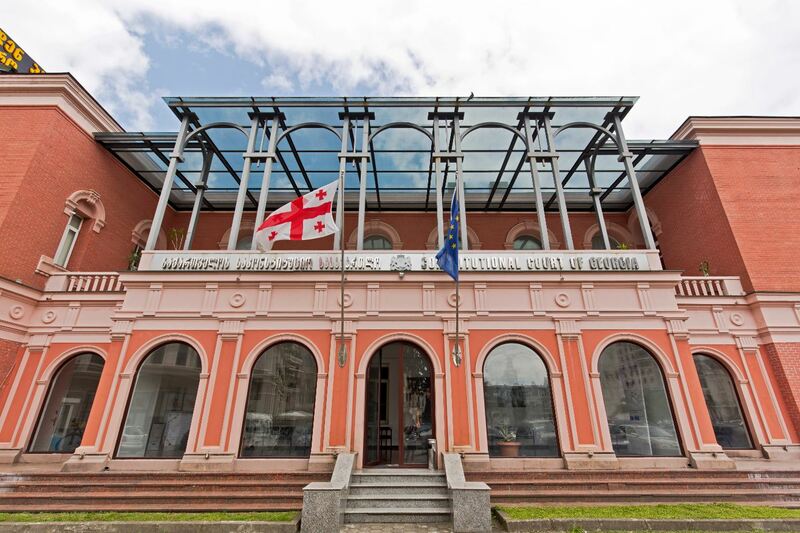 The Constitutional Court of Georgia established important standards with regard to cases where either of economic agents controls activities of other economic agents in the same field and has an access to their commercial information. These standards will contribute to the creation of the free market as well as the development of competition, as it will ensure uninterrupted course of entrepreneurial activities. Consistent and foreseeable practice of the Constitutional Court forms important grounds for legal certainty and stability. Within the course of constitutional proceedings, cases might arise where legal or factual circumstances upon which a relevant judgment of the Constitutional Court was based were changed. Thus, interpretation of the Constitution as provided in these judgments might not satisfy the requirements of the development of certain aspects of social relations. The practice of the Constitutional Court should not be too rigid and it should constantly meet the requirements of the dynamic process of the development of the society and the law. Last year, the Constitutional Court changed its practice with respect to the right to access official documents stored in state institutions. According to the previously existing practice of the Constitutional Court, this right did not encompass the possibility of having an access to information pertaining to health, finances, or other private matters of another individual. The Constitutional Court noted that the right to access official documents stored in state institutions also included the possibility of obtaining information related to health, finances, or other private matters of other persons. This aspect of the right is in conflict with the right of an individual not to have information regarding his or her health, finances and other private matters accessed by anyone without their prior consent. The Constitutional Court ruled that, given the conflict between these two rights, the issue is to be resolved on a case-by-case basis, in accordance with the principle of proportionality. Constitutional requirements regarding the right to access information were not met by the previously existing regulation, which a priori excluded an access to a certain type of information stored in state institutions. From this point of view, the scope of the right to access information was broadened, and the standards for its protection were heightened. During the last year, the Constitutional Court had to adjudicate once again on the issue of the right of foreign citizens to obtain agricultural lands. The Constitutional Court had already rendered its judgment on this matter, where it found that prohibiting foreign citizens from owning agricultural lands was unconstitutional. The Constitutional Court noted that the provision under consideration contained regulation identical to that of the regulation which had previously been declared unconstitutional. In this case, the Constitutional Court did not deem it necessary to change the existing practice, it followed its precedent once again and found the provision prohibiting foreign citizens from obtaining ownership rights on agricultural lands void at the preliminary stage without hearing the case on merits. On 16 December 2018, amendments to the Constitution of Georgia entered into force. Unequivocally, this is an important matter for constitutional adjudication. The scope of activities of the Constitutional Court of Georgia are inherently limited by the Constitution of Georgia and the order of values expressed therein. As a result of constitutional changes, some constitutional provisions have been formulated distinctively, which might lead to the necessity of adopting their different interpretation and application. Thus, given the amendments introduced to the Constitution, it is important to preserve the Constitutional Court’s well-established practice regarding fundamental human rights. Due to the constitutional amendments, activities and functions of the Constitutional Court of Georgia is regulated by the organic law. Before the said changes entered into force, activities of the Constitutional Court of Georgia were regulated under the Organic Law “On the Constitutional Court of Georgia” and the Law of Georgia “On Constitutional Proceedings”. Following the changes in the legislation on the functioning of the Constitutional Court, the two laws were combined. As a result of these changes, some legal flaws as well as duplication of regulations has occurred. It is essential for legislation on constitutional proceedings to enable effective constitutional control and proper protection of fundamental human rights and liberties. Hence, it is necessary to eradicate existing flaws in the near future by close cooperation of the Constitutional Court of Georgia and the legislative branch, so that the Constitutional Court is able to continue performing its constitutional functions without obstacles, in a more efficient manner. We believe, that informing the branches of the government as well as the public on the activities and challenges of the Constitutional Court will play an important role in the irreversible process of protecting and strengthening supremacy of the constitution in Georgia. Protection of the supremacy of the constitution is a multidimensional process. Constant engagement of every branch of the government as well as the society is necessary for this process to be efficient. Active and proper involvement of the society will significantly simplify the process of protection of constitutional order and the values enshrined in the Constitution. During 2018 the Constitutional Court of Georgia actively performed at the Intentional level and implemented a series of events. From January 1, 2018 the Association of Constitutional Justice of the Countries of the Baltic and Black Sea Regions (BBCJ) was chaired for a one-year term by the Constitutional Court of Georgia. 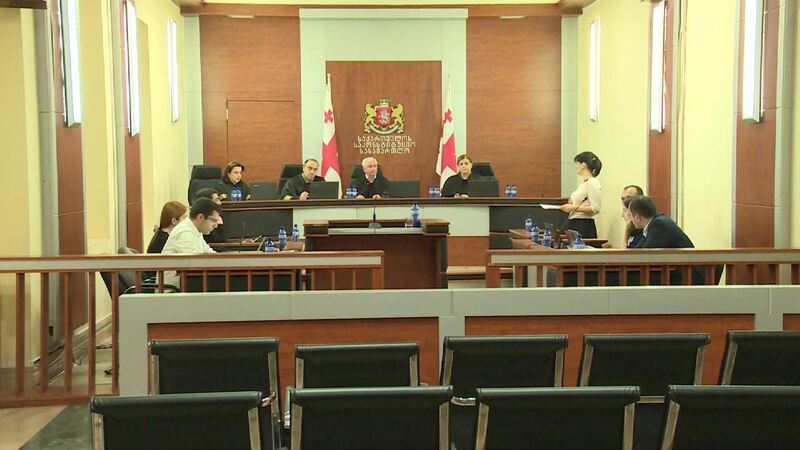 The CCG took over the presidency of the BBCJ from the Constitutional Court of Ukraine. BBCJ aims at promoting the protection of human rights and fundamental freedoms, as well as the independence of constitutional courts, implementing rule of law principles, and enhancing the exchange of experience between its members. The BBCJ Declaration on the establishment of the Association was signed in Vilnius on October 25, 2015 by the Presidents of the Constitutional Courts of Ukraine, Georgia, Lithuania and Moldova. According to this declaration, the constitutional courts of the member States assert their intention to strengthen constitutional justice in their countries; agree to facilitate dialogue on all issues concerning institutional, structural and operational aspects of constitutional jurisdiction; assert their willingness to use in the most efficient way all the responsibilities and opportunities to enlarge and deepen their mutual cooperation in the field of constitutional justice. The General Assembly and the Secretary General are the organs of the Association through which it carries out its activities. The aims and functions of the Association, its structure, membership and financial aspects are defined by the Statute. The Association presidency shall be rotated on the basis of the alphabetical order of the names of the states represented by the members of the Association. Under the presidency of the Association, the first Working Meeting of the Presidents of the Member Constitutional Courts of the Association of Constitutional Justice of the Countries of the Baltic and Black Sea Regions was held on April 3-4, 2018 at the Hotel “Vinotel” in Tbilisi. The event was attended by the Presidents and Judges of the Constitutional Courts of Georgia, Lithuania, Moldova and the Ukraine. At the meeting the Statement on Condemning and aggression and Violations of Human Rights in the Occupied Territories of the Association of Constitutional Justice of the countries of the Baltic and Black Sea Regions (BBCJ) was signed. According to the Statement, Association Member Constitutional Courts (Georgia, Lithuania, Moldova and Ukraine) welcomes and strongly supports the efforts of Georgian, Moldovan and Ukrainian authorities in condemning the Russian Federation for the aggression and assault on sovereignty and territorial integrity of Georgia, Republic of Moldova and Ukraine as well as violation of human rights in the occupied territories thereof, and in persecuting those responsible for these crimes. Relevantly, the BBCJ calls on other constitutional justice institutions not to remain indifferent to aggression and other international crimes. It is particularly noteworthy that in the statement the focus is made on the Resolution adopted on 21 March 2018 by the Parliament of Georgia on the Gross Violation of Human Rights on the Occupied Territories of Abkhazia and South Ossetia/Tskhinvali Regions of Georgia by the Russian Federation and on the “Otkhozoria-Tatunashvili List”. 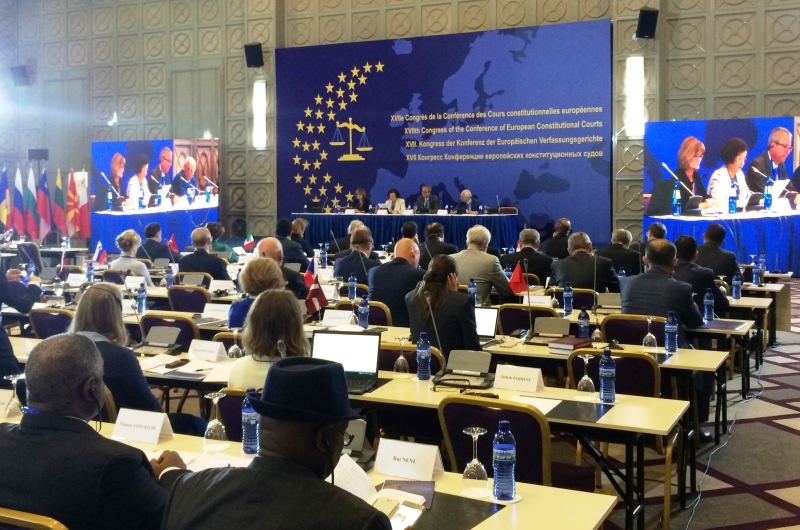 On May 15-17, 2018 the Constitutional Court of Georgia hosted the 3rd Congress of the Association of Constitutional Justice of the Countries of the Baltic and Black Sea Regions in Tbilisi. In the frame of planned event, the Presidents and Justices of the member Constitutional Courts of the Association of Constitutional Justice of the Countries of the Baltic and Black Sea Regions (BBCJ), as well as the representatives of the Venice Commission of the Council of Europe and other high-level delegates visited Tbilisi. Solemn Opening of the Congress was attended by the President of Georgia Mr. Giorgi Mamrgvelashvili and Prime Minister of Georgia Mr. Giorgi Kvirikashvili, Chairperson of The Supreme Court of Georgia Ms. Nino Gvenetadze, the 1st Vice President of the Venice Commission Ms. Herdis Kjerulf Thorgeirsdottir and the Deputy Head of EU Delegation to Georgia Mr. Carlo Natale, addressing the participants with welcome speeches. The theme of the 3rd Congress is the ′Role of the Constitutional Courts in European Integration Process′. The justices of the Member Constitutional Courts of the Association made presentations at the Congress. It is noteworthy that by the Decision taken at the the 3rd Congress of the Association from January 2019 the Association of Constitutional Justice of the Countries of the Baltic and Black Sea Regions (BBCJ) will be chaired by the Constitutional Court of the Republic of Lietuva. During 2017-2020, the Congress of European Constitutional Courts will be chaired by the Constitutional Court of Czech Republic. The President of the Constitutional Court of Georgia Mr. Zaza participated in the Preparatory Meeting of the Presidents of the XVIII Congress of European Constitutional Courts on June 13-14, 2018. In the frame of the event, the International Conference, dedicated to the 25th Anniversary of the Constitutional Court of the Czech Republic – “Our Beginnings: Hans Kelsen´s Heirs” was held. It is noteworthy that that during 2014-2017 the Constitutional Court of Georgia chaired the Congress of European Constitutional Courts and the Czech Republic overtook the presidency of the Congress from the Constitutional Court of Georgia in the beginning of previous summer. The Conference of European Constitutional Courts, which was established in 1971, brings together representatives of 41 European constitutional or equivalent courts conducting a constitutional review. The Conference organizes congresses at regular intervals. It promotes the exchange of information among its members on issues relating to the methods and practice of constitutional review and provides a forum for the participants to share opinions on institutional, structural and practical problems in the areas of public law and constitutional jurisdiction. Besides, it takes measures to strengthen the independence of constitutional courts as an essential element of the guarantee and implementation of democracy and a state under the rule of law and pays particular attention to the protection of human rights. The structure and competence of the Conference of European Constitutional Courts is regulated with its Statute and regulations. The Constitutional Court of Georgia has been a member of the abovementioned Conference since 2000. The President of the Constitutional Court of Georgia, Zaza Tavadze was elected by the Plenum of the Constitutional Court on October 20, 2016. From 2010 until 2016 he held the position of Vice-President of the Constitutional Court of Georgia. 2016-2017 he is the former Chairman of Conference of European Constitutional Courts. Since 2017 he is invited lecturer at the School of Law of Grigol Robakidze University. He graduated from the Open Humanitarian University of Georgia, Faculty of Law, with qualification of a lawyer in 1996. He obtained master's degree in 2002 at Ivane Javakhishvili Tbilisi State University, Faculty of Law, for German language. In 2008-2010 he graduated with honours from master's degree Program at the Faculty of Business and Management of Tbilisi State University of Economic Relations; obtained the degree of Master in Business Administration with the specialty of International Business Administration. From 2017 Mr. Zaza Tavadze studies at the School of Law of Grigol Robakidze University at the PhD level. Since 2018 he is a Professor of Grigol Robakidze University. Zaza Tavadze worked as the Deputy Minister of Justice of Georgia from 2008 to 2010. On March 30, 2010 he was appointed as a member of the Constitutional Court of Georgia by the Plenum of the Supreme Court of Georgia, he started to exercise the authority of the Judge on June 15, 2010 from the day of oath-taking.